This is a monthly feature I recently introduced. You can stream all the albums mentioned here for free at this Spotify link, which I keep updated. These two albums could be a preview of what my year-end "best of" list will look like. 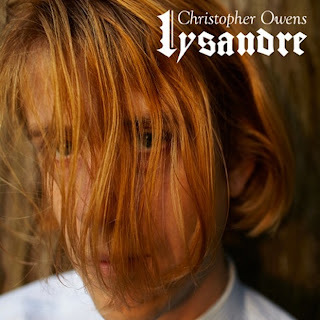 Cult-like musical magician Christopher Owens (whose recent concert I reviewed here) and L.A. classic-rock mash-upper duo Foxygen simply both blow me away. Buy Owens' Lysandre and Foxygen's We Are the 21st Century Ambassadors of Peace & Magic now. Readers of this blog probably know I put a lot of GBV out there. But really, it doesn't matter how many records leader Robert Pollard puts out per year (and it's a lot), I want them all. This is one of his best. Speaking of Pollard, this great lost band from 1980s Boston is inexplicably back, and the highlight of their resurgent power-pop record is a song called "Robert Pollard" (in which his voice is a dead ringer for my former bandmate and mentor who now helms the legendary Edwardsville, Illinois band Rock Hill Academy). Big Dipper's entire collection was recently released. Buy it all, fast. My son was in the process of getting married to The Highballers' showman-leader Kendall's daughter in their preschool class. That would have made this review a conflict of interest, but luckily it was clean-up time and the kids were unable to comlete the ceremony. Regardless, I saw this band live at Arlington's Artisphere and they were a force. It's easy to compare them to an offshoot of Johnny Cash and June Carter (what with the boy-girl vocals and all), but The Highballers are much funnier, have smoking and tasteful musicianship all around, have lots of songs about drinking (which is, let's admit, the point of honky tonk), and gloriously adds a modern twist ala Uncle Tupelo and The Bottle Rockets. One of my favorite space-rock bands of the 90s is back with possibly their best album in years. The seven-minute opener "Ohm" will surely go down as one of their finest songs, and the pace remains pretty strong through most of the record. If you like fuzz-psych bands dating from Jimi Hendrix to MGMT, then this is the new band for you. This is super catchy all the way through. They are from Australia and so probably don't tour the U.S. very often, but I imagine the live show would be large.